a guardian of childhood stories. Firstly I would like to thank everyone for their well wishes and lovely messages this week. I have been very under the weather but feeling more like myself I am pleased to report. It is very very cold at the moment and that is very much my battle right now as I can not keep warm. However this weekend is my long weekend in London. The excitement this morning here at HQ is building because this weekend is my Birthday treat weekend in London. My Birthday was last weekend but the ballet did not start until this weekend so celebrations were put on hold until then which in retrospect was very fortunate because I would not have been able to go at all. We are meeting friends from America there and some really good friends from here will be there as well and we are all out for a meal on the Friday Night in town. The Saturday night well that is the ballet and it is The Nutcracker my all time favourite. Gorgeous dresses will be worn and the men will be in DJ's ... Little thing though I said to a really close friend of mine that did she think I could get away with wearing my PJ's to the Ballet as I am the most cosiest and warmest in them right now .... her reply ' well of course they are considered evening wear' It made me really laugh! I am excited about going it is just the thought of it all as I am not firing on all cylinders I am afraid. Still it might be what I need to jump start me back in to full speed ahead mode. We have had this planned for months and months and so the excitement has been building. We are there for 4 days and I really can not wait to see all my friends as well. We will be doing some Christmas shopping as well and picking bits up that you can only seem to get in Town. Fortnum and Mason is a true favourite for some special foody bits for the season. The tradition for marmalade and jam with glitter in it for Christmas and January has been going for years now in this house and I always get it in Fortnums! we can all go together. House sitter in place and well I am raring to go. No work will be done today I just know it. It was going to be a tidy the stitchery room day today but I think a 'potter about' is more in order. It is so near now to Christmas that I will be stopping work next week so my last blog will be next Tuesday/Wednesday and my break dates will be on here then for you to jot down. There is no blog on Monday as I will still be in Town and not returning until later that day. As I have been poorly I thought I would do a blog on Wednesday as well. I am lucky enough that dear friends are flying in from America to help celebrate my Birthday and also it is Cyndi's Birthday that weekend so we are both Birthday girls ... there was talk of tiara;s being brought over .... There are going to be lots of laughs this weekend and I must say I am looking forward to the Ballet. 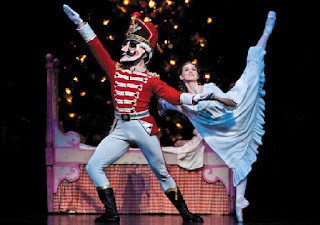 I love the story of The Nutcracker and it brings back the child in me. When the lights go down and the curtains rise I know I will immerse myself in the wonder. The trick is to dress warmly but still look elegant for me right now. I am taking a cosy shawl with me and that should do the trick. There is also now talk of Winter wonderland in London as well so warm again and my bubble hat and ugg boots are the key. I believe this is just what I need to force me going with Christmas upon us as well I am very behind in my prep. Not to worry it will all come together. I hope you all have a wonderful weekend and wrap up warm I will be back on Tuesday, once again you lovely people THANK YOU for all your kindness. Have a lovely time. The Nutcracker is my favourite too. It is really odd this year, my partner has done Nutcracker nearly every year for the last 17 years. The company pushed him out and this year he is doing panto at our local theatre. It's brilliant. Wonder who you are going to see - ENB or BRB? Whoever, have a really fab time! Thank you it was the Royal Ballet production and it was truly wonderful. So pleased that your partner is in a panto, how wonderful .. Thank you Mo, it was truly wonderful and London was great. I nice short break before the madness that has now hit us all. Have a very Happy Christmas Mo and lots of fizz! !